Gone are the days when you needed to hire app developers for creating mobile apps. Thanks to app makers like Appy Pie, creating an app does not require coding knowledge anymore. You just need to have a clear picture of how you really want your app to work, and then leave everything else to this tool. 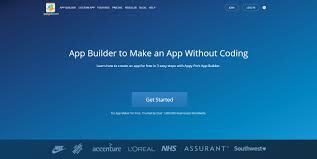 Appy Pie app builder, for instance, offers various templates and design tools to help people in creating customized apps for various purposes. Not only this, it also offers various other advanced features. Let’s explore some of them in our detailed Appy Pie review. Appy Pie supports almost all major platforms, including Android, iOS, Windows Mobile, and BlackBerry. This makes it easy for you to target more customers as you can easily work on multi-platform apps. What sets Appy Pie back is an additional step you have to take for getting your app submitted on all the major app stores. While other app vendors submit the app to app stores by merely clicking on the publish button, Apply Pie require you to send an email invitation to any of its representatives. You also have to add that representative as an admin in order to get your app submitted on different digital outlets. Appy Pie supports RSS Feeds so that you no longer have to send app users an email to let them know that new updates have arrived. In this digital world, it is difficult to ignore the importance of social media. Keeping this in mind, Appy Pie offers social networking app builder, allowing you to remain in touch with all your app users. It also integrates Facebook, Twitter, and YouTube to keep users engaged. Creating an app is as simple, easy and enjoyable as creating a pie. This is what the app vendor claims as this app builder does not require any coding skills. Its drag-and-drop menu enables you to complete the app creation process in three steps. You just need to select the category, build the app using the given tools, and publish it. Appy Pie allows you to add an app analytics feature in your app. The good thing is that you can customize this feature as per your need. Not only this, you can use this feature to connect your app with Google analytics to get real-time information regarding the performance and growth of your app. Google Analytics reveals information like the number of organic searches, page views, and audience overview among other things. Appy Pie makes sure your app users remain engaged. Its lets you send push notifications to inform users about upcoming products, services and offers. You may also use its event planner to promote all your upcoming events. Appy Pie lets you convert your website into a mobile app by importing all its content. The whole process is very simple and easy. You just need to enter the URL of your website to import all its pages. Appy Pie does its job of creating apps wonderfully. Its advanced features along with its pricing plans make it one of the leading app builders available in the digital marketplace.